A Fire Drill is an exercise in which a building is evacuated as if there were an actual fire. Usually, the building's fire alarm sounds to denote this. Fire drills are most common in schools, where monthly fire drills are usually required by law in the United States, but fire drills also take place in businesses, dormitories, and other public buildings. 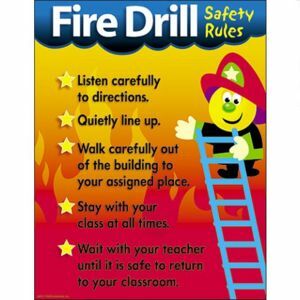 Fire drills are practiced regularly in American schools to ensure the children will not panic and know automatically what they should do. The usual procedure for a school fire drill is roughly as follows: The alarm sounds, and everybody will immediately stop whatever they are doing and file out the door and through the nearest exit in an orderly but fast manner, generally without running. The students will line up in an area somewhat far from the school (as it is not safe to stand too close to a burning building), and the teacher will usually count roll to ensure that all students are safely outside of the building. When the drill is complete, a bell will ring to signal that it is safe to re-enter the building. Another purpose of fire drills is to ensure that all alarm equipment is properly working. In the United Kingdom, schools are only required to hold one fire drill per year. A "Chinese fire drill" refers to a situation in which a car stops at a stoplight, and everybody in the car gets out of the car and re-enters the car, sitting in a different seat. This page was last modified on 27 June 2016, at 19:48. This page has been accessed 191,493 times.